The Vikings are bored. They go looking for adventure but find themselves stuck for ideas. Everything they can think of they have done before. 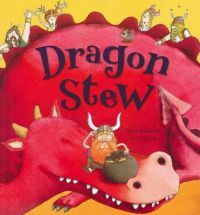 They just can’t think of something new, until one of them suggests catching a dragon and taking it into Dragon Stew. Their journey to finding a dragon is fraught with adventure and when they finally arrive at their destination it is clear they really have never done this before. Those Vikings really are in for a very big surprise. This is a wonderfully fun picture book. The story is a joy to read out loud. The Vikings are fun and very silly. The illustrations are detailed, brightly coloured and somewhat cartoonish, especially then there are speech bubbles. A great choice if you are looking for something with dragons or an for a new pirate book, pirates and Vikings do have a lot in common.